Every animal in the world deserves respect and love, but if we’re plain honest, a lot of us humans are sort of scared of spiders, if not terrified. However, we recently learned that these animals might just be very misunderstood and also, they have tiny adorable paws! They’re fairly unnoticed by most people since we hadn’t dare look that close. 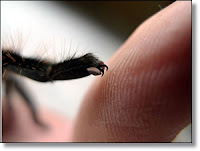 But when you zoom into pictures of spiders and their very complicated legs – which do more than just carry them around – you’ll notice their tiny little paws. Perhaps it’ll take us humans some time to still fully embrace the hidden adorableness of spiders, but here’s a look at their paws – hey, we gotta start somewhere!